This well-known lithograph is by the King’s School art master Louis Laurent Razé. The occasion is Speech Day and the year is 1845. After a service in the Cathedral, with a sermon by a former Headmaster, John Darby Birt, the congregation moved to the Chapter House for Speeches and the presentation of prizes. 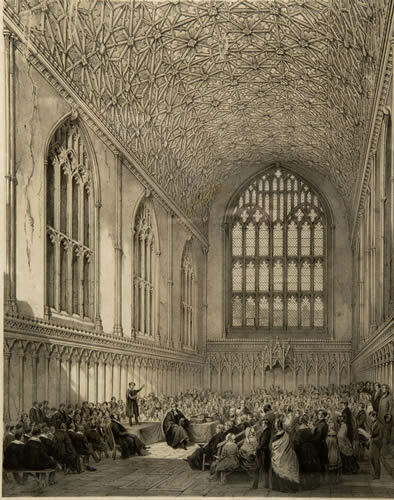 The speeches themselves were dramatic recitations and in 1845 there were sixteen of them, ranging from Euripides to Milton, Livy to Byron, and Shakespeare to Lord Chatham. The Headmaster, George Wallace, can be seen in the middle of the picture, and the audience for the declaiming boy included local clergy, several aldermen of Canterbury and the Members of Parliament for East Kent, as well as many parents. Later the gentlemen adjourned to the Royal Fountain Hotel for a dinner and more speeches and toasts. The whole event was organised by the Feast Society, a predecessor of the OKS Association, and it was fully reported in the local press.